Aiming to be more than just a grand fashion showcase for local designers, 2018 F/W HERA Seoul Fashion Week intends to be a bridge for local brands to reach out to overseas markets. 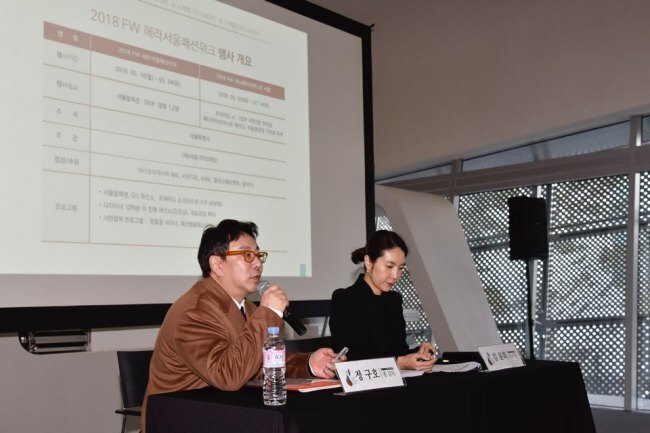 The fashion event will take place from March 19 to 24 at Dongdaemun Design Plaza in Seoul, serving as a venue for an intensive examination of Korea’s fashion scene. A total of 40 local fashion brands are to participate through the Seoul Collection, the main event of the week, showing the trends for the upcoming fall/winter seasons. Generation Next, a separate showcase promoting independent designers who have worked as professionals for less than five years, will be hosted alongside the main collection. The newbie brands’ samples can be purchased at the scene at a discounted price. Celebrated fashion designer Jung Kuho, the executive director of Seoul Fashion Week, is leading the event once again, his fourth year directing the fashion week. “The goal is to promote local designers to foreign markets,” Jung said at a press conference Tuesday, pointing out that more than 180 buyers from Asia, Europe, America and Arab countries’ high-end department stores and select online shops are invited. “We cannot do business for them, but we can make a business network, providing opportunities,” he added. “As a fashion designer myself, I tend to focus on promoting designers, rather than the cultural aspect of the event,” he said. But he does not neglect the importance of making the event a cultural festival for the public. The event aims to be entertainment for everyone, moving beyond the concept of an exclusive fashion venue for business insiders. Visitors can enjoy Fashion Film Festival, hosted at the venue from March 22 to 24. Mentoring seminars are also arranged. Professionals from various industries are to share their knowledge and experiences to enlighten the participants. Hanbok designer Kim Hye-soon is to kick off the fashion event through the opening collection. Jung would like to show the beauty of hanbok to the foreign press, media and buyers. Off-shows will also take place during the fashion festival, throughout Seoul, as several brands will host their own shows at separate venues. For foreign buyers, it may be a chance to explore Seoul, as they keep up with the fashion events. “Off-shows’ popularity has been enormous, some even ‘threatening’ the main event of the fashion week,” Jung said. The organizers of the Seoul Fashion Week are determined to open up new opportunities for local designers, not only through making their names known to the foreign businesses but also to the general public.